Edit: This is an old post. You'll see a few of these pop up as I shift over from my old blog. I love these little guys. They're perfect for travel, they're perfect for small stamping projects, they're perfect for using with a multi-stamping tool...they're just great all-around. 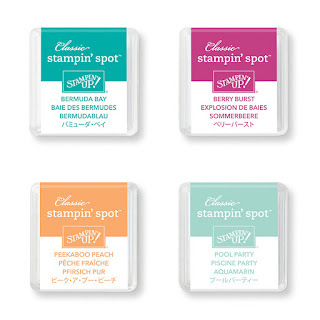 Stampin' Up carries several pre-inked Spots and packages of un-inked Spots (which you can turn into a mini of your regular Stampin' Pad using the reinker - smart, right??). Just like our Pads, the Spots are best when stored upside down. This presents a problem, because the underside of the Spots is white. Every. Single. Spot. So you really have no way of knowing which color you're pulling out until it's out, and keeping them organized in a color scheme (I'm a rainbow girl myself) is all but impossible. Today I bring to you a solution for both of these problems. You're going to need a small stamp (I use a heart from Coffee Cafe`), an acrylic stamp block, a scrap of Whisper White, mini glue dots, a 1" circle punch, a pen, and your Stampin' Spots. Punch out one circle for every Spot you have. Stamp your image at the top of each circle for each different spot (Ex: if you have 5 colors, you want 5 circles, each with a different color), and write the name of the color below the image. Attach 2 mini glue dots to the back of each circle and adhere each circle to its corresponding Spot. Now you can see, at a glance, which colors you have, and you can organize them more easily, too. If you have a dilemma you would like me to find a solution for, just drop me a note! I'll be happy to try and tackle it. Maybe it'll be my next Tuesday Tip topic!